I don't think that there is any meal that is more of a conundrum than breakfast. I used to work for a company had a full catered breakfast every day. Each morning I was confronted with the hellish task of trying to avoid eating fried eggs, bacon, sausage, and toast everyday. On my best days, I could avoid all that and go for something healthier, fruit muesli, or avocado and salmon. In truth, I didn't really want any of it, I don't really like eating in the morning, but I do need energy as my metabolism continues to gallop like a race-horse. Many moons ago, when I was lucky enough to live with a nutritionist named Nisha Moodley, she turned me onto the joys of the morning smoothie. She called them nutritional super-bombs and educated me on the different supplements and ingredients you could add. Since starting to work remotely, I've gotten back into the swing of making these smoothies, and I'm loving it. I've done a fair amount of reading and research and have fine tuned my smoothie to my nutritional needs. I'll walk you through the ingredients I use and the sites I've used to do my (informal) research. 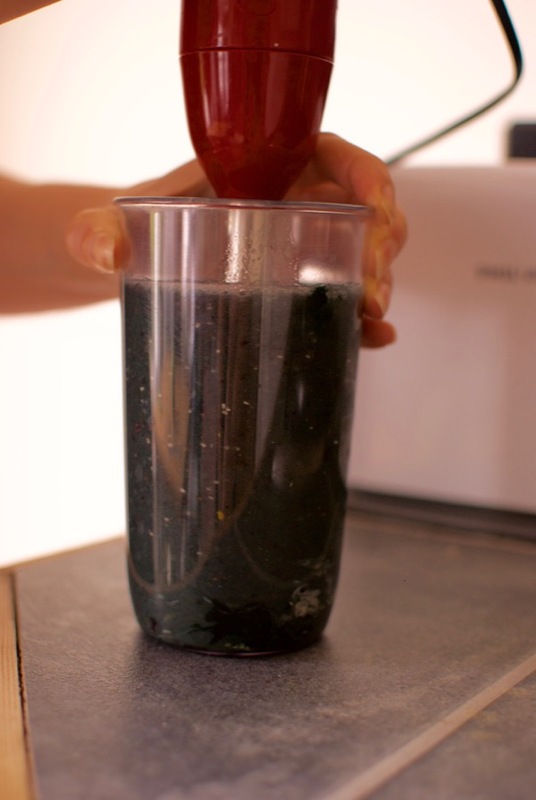 My #1 goal with my smoothie is to try help my digestion and my gut. For the past few years, I've experienced some pretty severe pains in my digestive track, usually when I wake up in the morning. This is due to a lactose intolerance and a sensitivity to refined flours. Despite knowing this, I haven't been able to cut those foods out entirely (oops, but pizza!) and my gut has been the victim. Most of the foods I add to my smoothie have a benefit to soothing and regulating the digestive system. The other thing I'm looking for are good sources of minerals, which all of these foods are. Minerals help maintain metabolism, decrease hypertension, and regulate energy. They also help you sleep better and ease out things like jumpy leg syndrome, which I get a fair amount. Blueberries - Frozen blueberries are a great foundation. I use about a 1/2 cup per smoothie. Using them frozen means that the smoothie is more like a cold milkshake. Frozen blueberries have also been proven to retain 99% of their nutritional value up to a year after freezing, so they are convenient and still good for you. Blueberries are also acknowledged as one of the most nutrient dense foods and contain iron, phosphorous, calcium, magnesium, manganese, zinc, vitamin K, vitamin C, vitamin A and gallic acid. Blueberries fight inflammation, improve brain function and aid digestion. They also taste really good. Bananas or Avocado - Depending on whether or not I'm trying to avoid sugar, I use 1/2 a banana or 1/2 avocado for creaminess. Bananas are a obviously a great source of potassium, and their natural sugars mixed with fibers that release them slowly give a great start to the day. Avocados are one of the best sources of healthy fats, and pack in many of the same vitamins as blueberries, but double down on thiamine, riboflavin, and niacin. Coconut water - This water is low in calories, and light on the stomach. It helps boost the immune system and full of antioxidants, b-complex vitamins, and all those lovely minerals mentioned above. Cacao nibs - These little nibs are the least processed form of chocolate. They are high in antioxidants, flavonoids, potassium, magnesium and apparently cause the brain to release phenylethylamine, which released endorphins in the brain. I find that adding Cacao to my smoothie gives me a bit of a kick similar to coffee without the jitters. Bee pollen - This is a new addition, but it's been a life saver. I started suffering from allergies to tree pollen a few years back and each year it seems to take me down more and more. This year, when they struck I started adding bee pollen to my smoothies and within 2 days all the symptoms had completely stopped. Added bonus, bee pollen has also been proven to inhibit the growth of certain kinds of bacteria. It also helps regulate intestinal function. 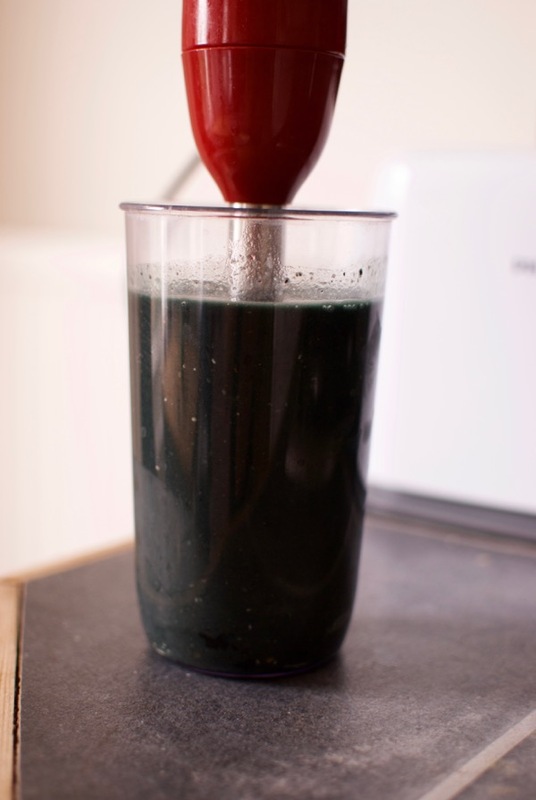 Spirulina - This is the ingredient that creates the deep green color of the smoothie and it's the weirdest thing I put in there. It's algae, it's not generally well-known but it's absurdly good for you. The main reason I use it is because it helps balance out the gut by eliminating candida and promoting the growth of health gut bacteria. The list of what else is does is as long as your arm. Chia Seeds - These little guys have gotten a lot of attention in the last few years. Very rich in antioxidants, and omega-3 fatty acids. Chia seeds contain really high levels of minerals like manganese, and magnesium and are one of the best sources of fiber. 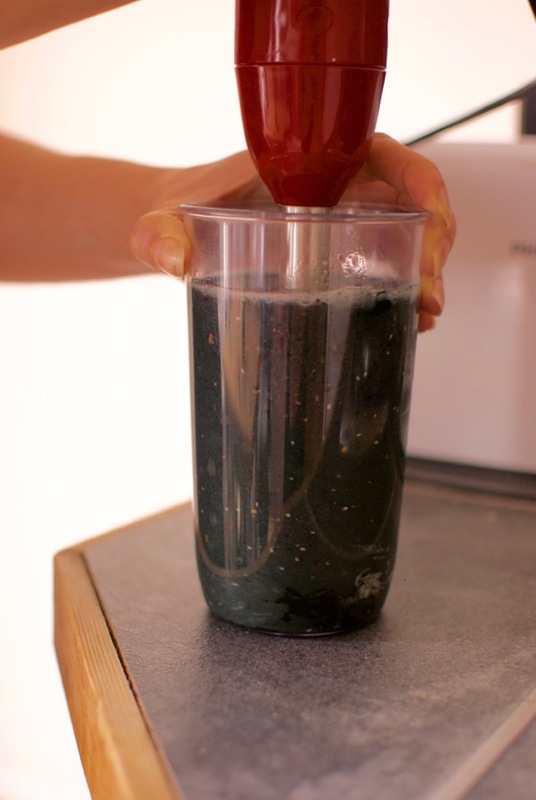 They also add a gelatinous quality to drinks, so if you want a creamier quality to your smoothie, make it early and let it sit for an hour then stir. Nutmeg - Nutmeg has actually been used for millennia as medicine for the stomach. Mixing a teaspoon in honey is a cure for nausea. Rich in antioxidants, beta-carotene, and riboflavin, nutmeg has anti-fungal qualities, and also has claims to anti-depressant qualities. It adds a nice nuttiness to the smoothie as well. Collagen powder - I'm pretty sure if you're slightly tuned into health speak, you've heard about the benefits of bone broth, or stock as normal people call it. Stock is good for you because it contains collagen. Hydrolyzed collagen powder is that element of stock dried and powdered. Collagen is one the best ways to heal your gut and I've found that I've seen a massive improvement since adding this. It also has the added benefit of improving hair, skin and nails, and that's never a bad thing. You can find most of the ingredients at health food stores like Planet Organic or Whole Foods. Amazon also stocks a lot of them as well. It's a bit of an investment up front, as many of these supplements are on the spendy side, but the improvement I've experienced in energy and digestive health are well worth it. *Tools note: I use an immersion blender as opposed to a jug blender, because I find it easier and less fuss to clean, especially when using it everyday. Place all ingredients in your blender. 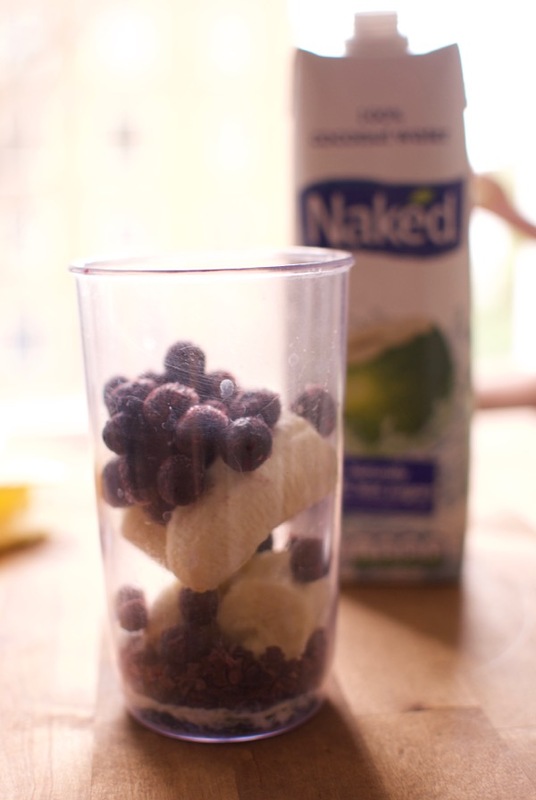 Pour enough coconut water to just cover the ingredients. Blend until smooth. This makes one really big smoothie or two smaller ones. Enjoy as a meal replacement or with breakfast.